DAYTONA BEACH, Fla. (April 13, 2018) – The Springfield Mile is proud and honored to announce that legendary motorsports journalist, commentator and Motorcycle Hall of Fame inductee Dave Despain will return to the Springfield Mile as Grand Marshal for the 99th running of the iconic race on May 27. 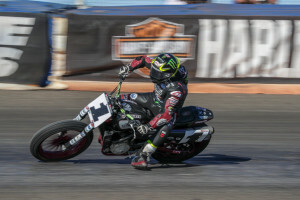 Despain, who is widely regarded as the best-known on-air personality in all of motorcycling and arguably ‘the voice’ of American motorcycle racing, has deep roots at Springfield and in dirt track racing in general. He began racing in the mid-1960s on a Bultaco 250, but gravitated toward racing PR and announcing as motorcycling and motorcycle racing exploded across the U.S. in the late 1960s and ’70s. Despain began announcing at Springfield in 1981, and to this day folks long to hear his voice over the P.A. system. After a long broadcasting career in which he hosted a range of televised motorsports shows, including TBS’s Motorweek Illustrated, ESPN’s Speedweek, Speedvision’s Bike Week and ESPN’s coverage of AMA Grand National dirt track races, Despain got into race promoting when he inaugurated the Dirt Track Hall of Fame race in Springfield, Illinois. The race offered a $100,000 purse and became the richest on the Grand National Championship calendar. 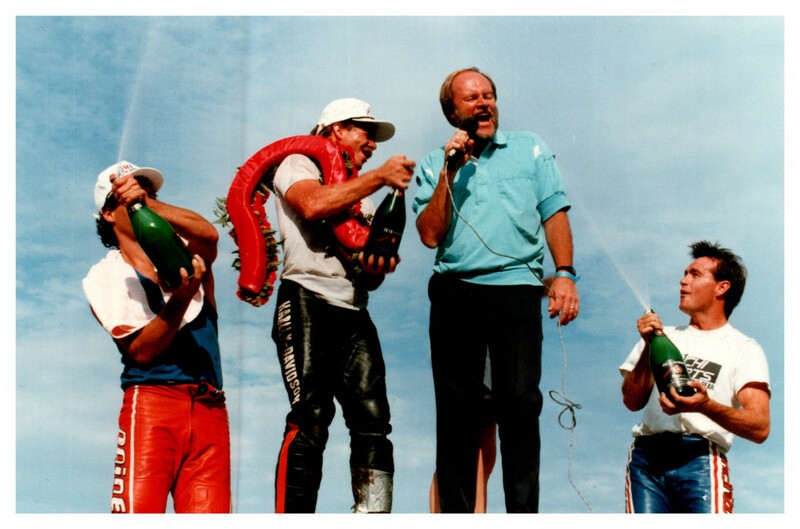 "I fell in love with the Springfield Mile back in 1981,” said Despain. 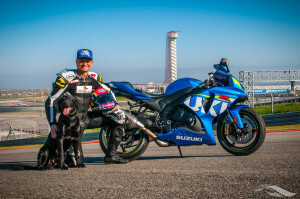 “Motorcycle racing returned to the legendary fairgrounds track after a 15-year hiatus and I was the P.A. announcer. The place has so much history, written by all the legendary names who starred here. I have a lot of great Springfield memories, including helping to promote the $100,000 Dirt Track Hall of Fame Race. But the key to it all is the quality of the racing. 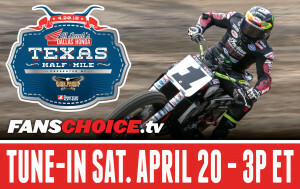 I think it's the best motorcycle race of the year, and I'm honored to serve as Grand Marshal on Memorial Day weekend." Despain interviews the late Ricky Graham at Springfield back in the mid-'80s. 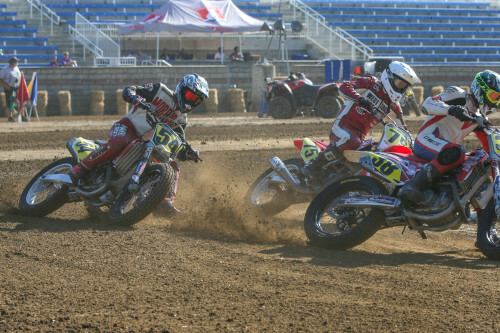 Memorial Day weekend at the Illinois State Fairgrounds promises to be an exciting time for all motorcycle and racing enthusiasts. It all starts Friday night, May 25th, when Springfield and the Springfield Sliders minor league baseball club welcomes the legendary Beach Boys for a very special concert at Robin Roberts Stadium, just a few blocks from the racetrack at the Illinois State Fairgrounds. On Saturday night, May 26th, the All-Star Springfield TT and AFT Singles TT races kick-start the racing action. Featuring a high-flying jump and a tight right-hand corner, the TT event is non-stop action all evening long. On Sunday the 27th comes the lightning fast and legendary Springfield Mile featuring AFT Twins presented by Vance & Hines and a Production Twins support class, with lead changes on every lap and the drafting wars Springfield is famous for. Dave Despain will welcome the crowd at 1:00 pm and start off the afternoon of fun and thrills for the entire family. Lead Photo: Dave Despain enjoys a champagne shower from Bubba Shobert (right), Ricky Graham (far left) and Scotty Parker (near left). Talk about a famous foursome!